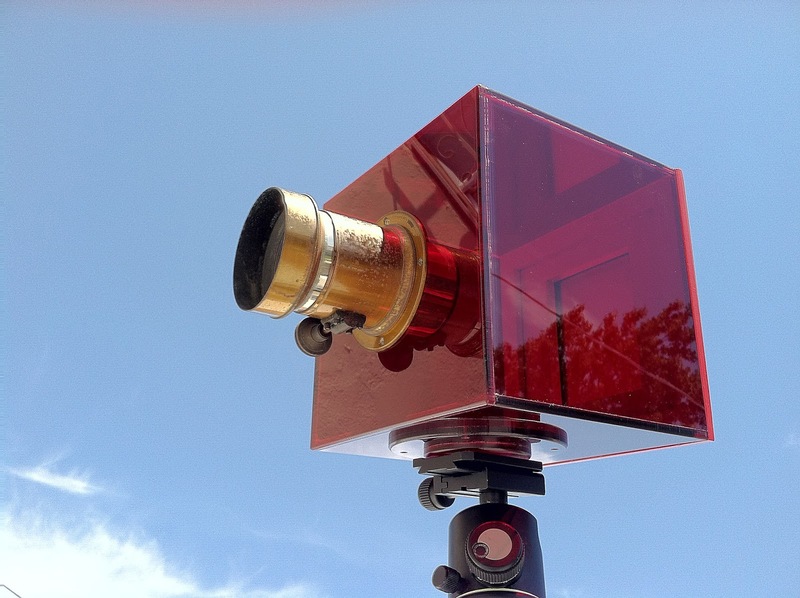 Introducing CLERA - 1st Transparent Camera! The day has come my friends! After months of being nothing more than a dream and concept, weeks of experimenting and building, and days of testing and working out the kinks today at San Diego Museum of Photographic Arts I will be unveiling what I believe to be first completely transparent and entirely functional camera. I call it CLERA, short for Clear Camera, and without further ado here it is pictured against the clear San Diego skies. It is the first camera where you can actually SEE the image projected onto the piece of photographic material during the exposure! 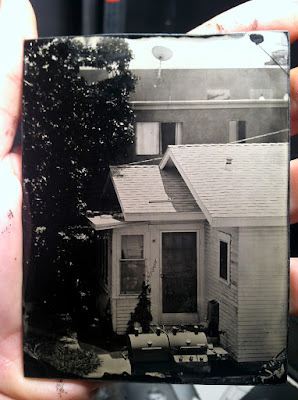 I came up with this idea while working in my dark box and developing tintypes. 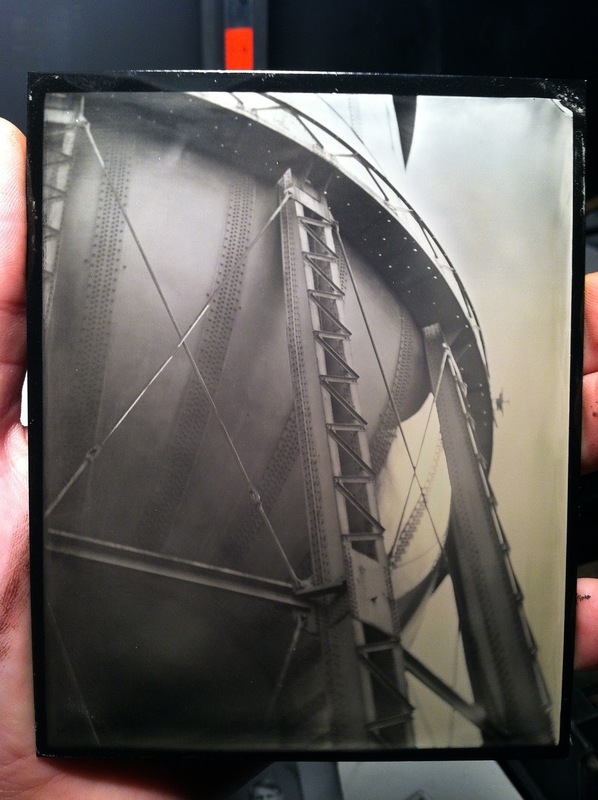 Those of you familiar with my work know that for the past few years the medium of wet plate collodion has consumed my photographic endeavors almost entirely. 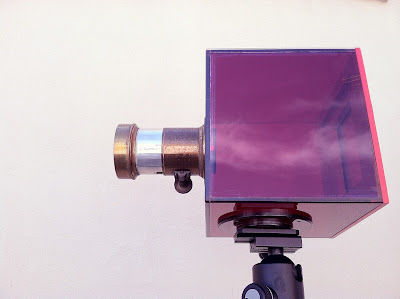 For those not familiar with the process I will briefly state that is involves coating, exposing and processing a metal or glass plate within the span ranging from a few minuted to maybe half an hour or so depending on meteorologic conditions and the emulsion is sensitive mostly to the UV end of the visible spectrum of light. Due to the plate having to stay wet, a darkroom of some sort must be present wherever one chooses to make an image. 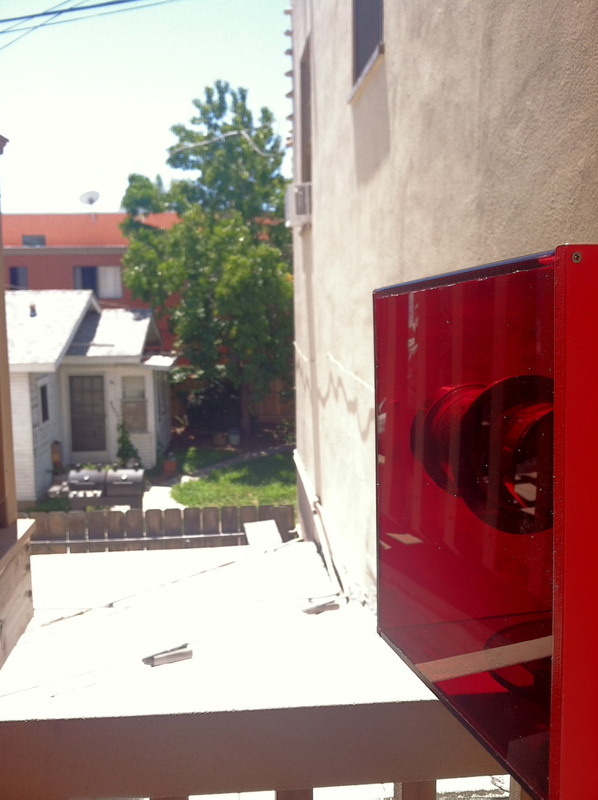 In my case I use a self-made dark box with red windows. Quite often my box was positioned in such a way that during the 30 seconds of development sun was shining through the windows directly onto the plate and no light fogging was present in the final image. 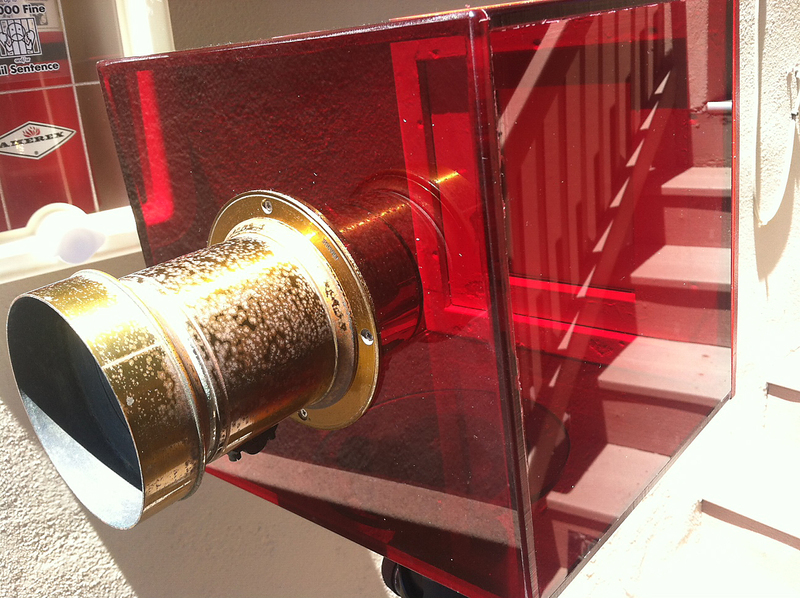 That's when it struck me - why not make a camera out of red material that would filter out UV and blue light!? Wouldn't it be cool to actually SEE the rays of light striking whatever light sensitive material one chose to capture an image with during the actual moment of exposure? With that in mind I set out to experiment. 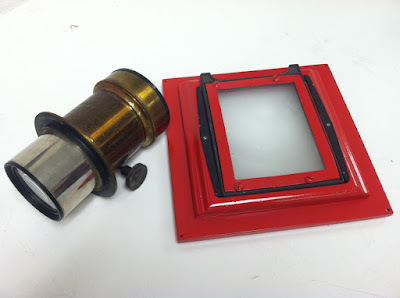 First off I had to design something simple for the very first prototype - I didn't want to overdo it and not have it work (though after thinking for a while about it I saw no reason why it shouldn't work.... For that reason I chose a classic design of a simple daguerreotype box camera. 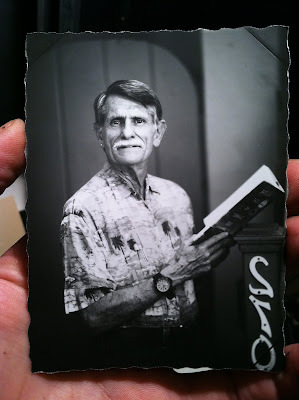 It's infinite simplicity is praise-worthy. 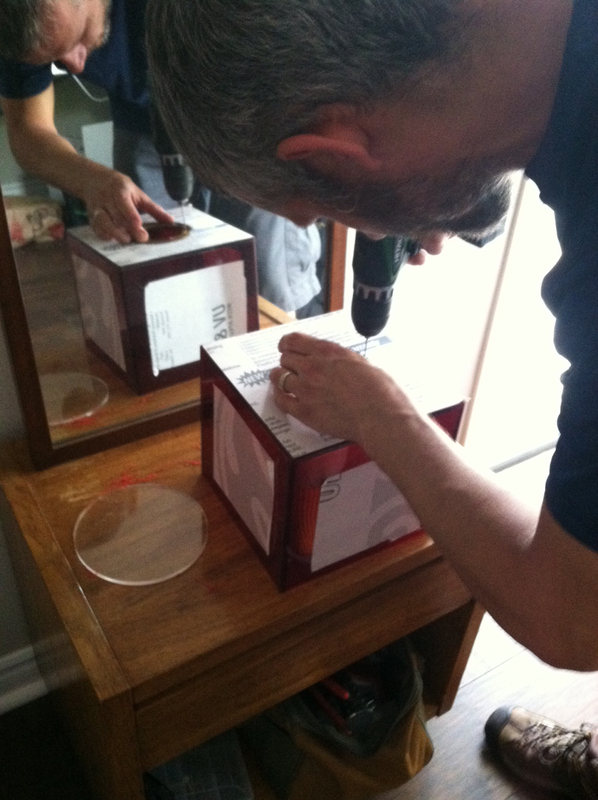 A box is made in a proper length for a selected lens to be able to focus on infinity. The lens then provides the ability to focus closer via a rack and pinion system. All you need to complete it is a ground glass focusing back that takes a plate holder and you're in business. I hunted eBay for a while and found a great 19th century Petzval lens that was not too expensive and of a proper covering power. The lens has no maker mark engraved on it, but upon opening it up to clean the elements I saw G & C written on the edges of glass making me believe it was made by a Parisian company Gasc & Charconnet. The company was founded in 1850s, but this lens could have been made as late as 1880s, there's really no way of knowing this with any degree of certainty. Lens is of an 8in focal length, f4 and lacks provision for Waterhouse stops because it was originally made for magic lantern projectors. I had a spare 4x5in camera back kicking around my parts pile and painted it red to match the body it would go on. I think the back came from a sliding back adapter for 8x10 cameras, but it might have come from any number of wooden cameras of 1900-1950s. There's a great local plastics manufacturing business near me where I have had many things build in the past, so I made a few trips there and tried out several transparent red materials and finally settled on one particular polycarbonate. Unlike regular plexiglass it is nearly indestructible and also comes with a layer that prevents scuffs and scratches, so CLERA is going to stay intact and shiny for a long long time. One of the employees there, Abraham, is especially kind and understanding of the plight of artists-experimenters, so he worked with me on this in a very accommodating way and for that I am forever grateful. Here he is tapping the threads for the lens flange screws at his home workshop last Friday after work. I will spare you the details of all the testing I put the camera though and all the headaches and confusion I underwent before figuring out why some of the images were coming out foggy. I will just say that after three days of non-stop experimentation and deductive empiricism it now works flawlessly in any conditions. 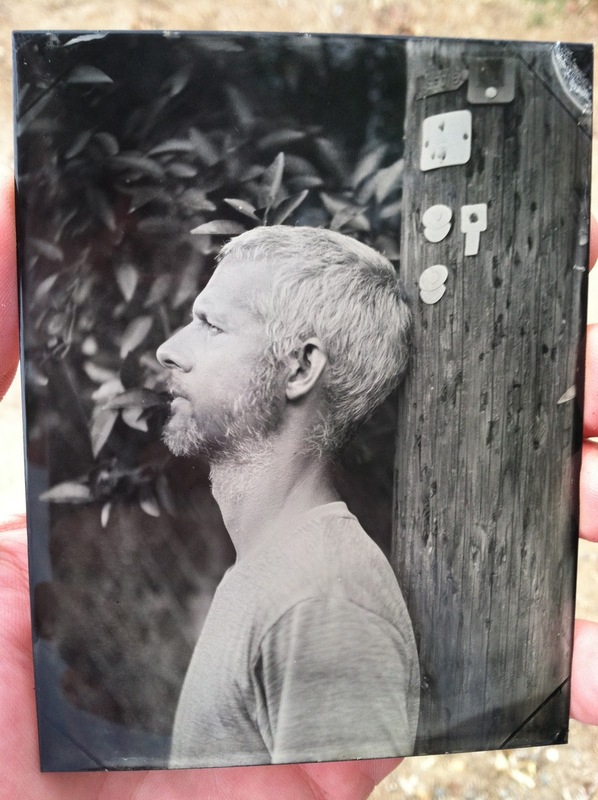 Here is the first tintype plate made with CLERA - featuring Abraham in his back alley right after the camera was assembled. Pardon the reflections on the bottom. Here is the last in the line of experimental plates - this one finally shows zero fog (the fog, by the way was being caused by light reflecting inside the lens barrel and not by the camera material). It is not the most visually exciting composition, but I dare to say that this is the most tintyped back yard in America that doesn't actually belong to a tintype artist - it's the view from the stairs leading up to my darkroom and that's where I conduct any tests of new lenses and other equipment. As you can see from the following pictures the camera was set up in direct sun with the sun actually shining on the plate through the top of the camera during exposure - no fog at all! 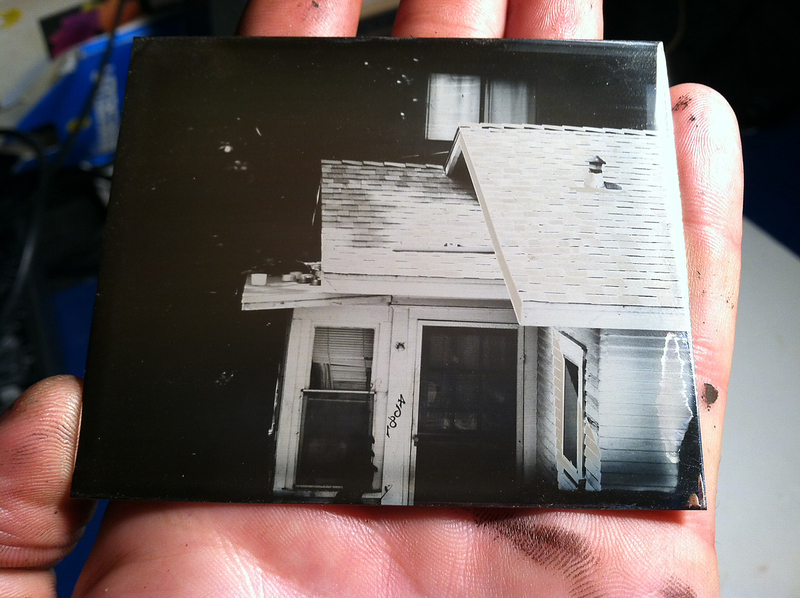 Here are some more test plates made in the past few days. Some of them are a bit fogged - this was all done before I figured out that the lens needed to be slightly modified in order to improve contrast. As you can see I was shooting with the camera pointed up because intuitively I knew that it was something about that position which cause the fog, but it took a bit longer than it probably should have to figure out that the black coating inside the lens was not as matte as it should have been because it's not technically a 'camera' lens, but a projection one. 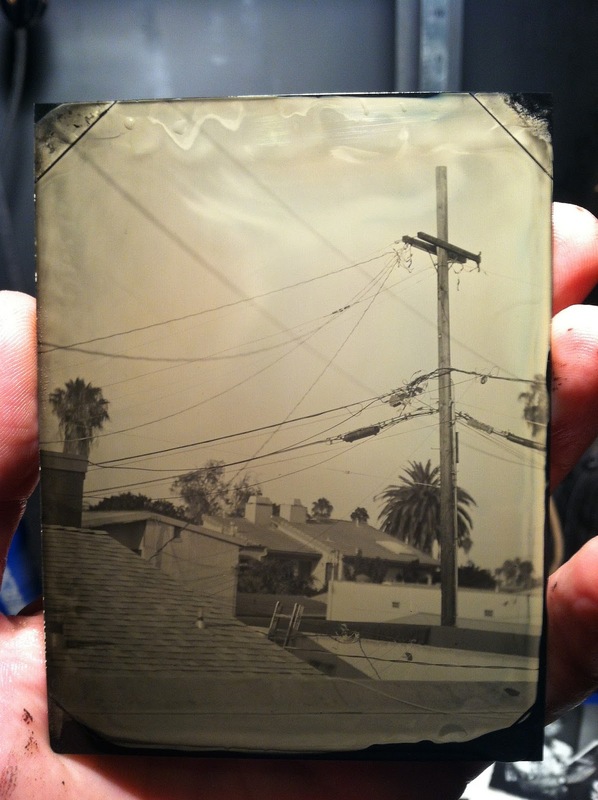 As I mentioned above tintype is an orthochromatic medium (sensitive to a single section of light spectrum - the spectrum range in around blue and UV end). There are other photographic materials that exhibit the same characteristics, some of which are daguerreotypes, photographic printing paper, lithographic as well as some regular films. I had some direct positive paper in my darkroom so I decided to try that out as well. Here is the result - a portrait of my neighbor Fred made on no longer produced Efke direct positive paper with ISO 2. 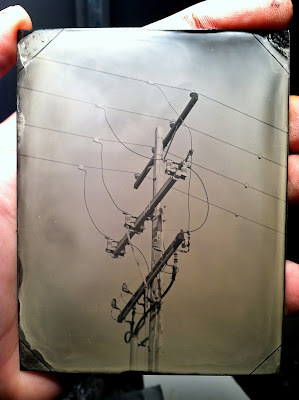 I plan on updating this post after tomorrow - that is when I will do an experiment with using CLERA to make a daguerreotype and develop it with Becquerel method right in the camera! I think it should work. I will also test a few films in the near future and post results here. If you have a lens that you would like to use you'll have to send it to me so I can do the needed calculations. If you have a back - that's great too. If not - no worries! I can find you a lens and back for the size images you'd like to make. I am also working on CLERA 2.0 - a sliding box design that will allow the use of various lenses and provide shorter focusing distances (this design can focus from infinity down to whatever distance the rack and pinion mechanism allows, which in my camera's case is about 6ft). Approximate prices with YOUR LENS are: $350 for 4x5 and smaller, $500 for 5x7 and $700 for 8x10. You will have to send me your lens for me to measure it exactly and to custom make you your own CLERA. Prices without you providing me a lens will vary, but maybe as little as $150 more for 4x5 to as much as $1000 more for 8x10 - lenses vary widely in price range, so if you don't have a lens you'd like to use you can email me and we can discuss options as related to budget. Today my initial theory that this CLERA would work to both expose and develop a daguerreotype using Becquerel method was confirmed. 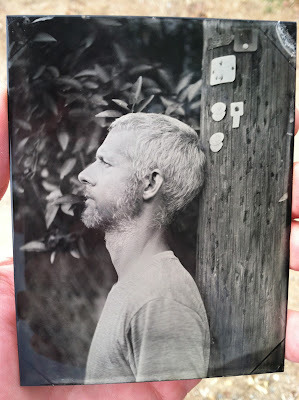 A local daguerreotypist by the name of Race Gentry came by the darkroom and helped make my first daguerreotype. I will stress that this is my first daguerreotype and it is a technique that takes years to master, so don't judge the performance of the camera by my feeble initial attempt. With Race's help though I think the plate came out rather well. 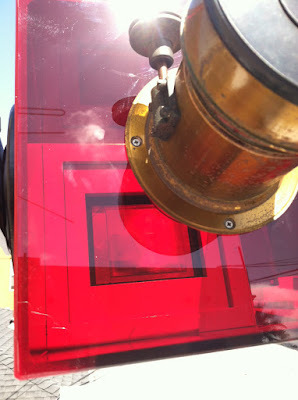 Becquerel method involves fuming a silver plate with only iodine and, after exposure, developing it by action of red light. CLERA was set up in direct sunlight for the 1min exposure and then turned in such a way that sun was shining directly onto the plate for 45 minutes (which is a relatively fast development time from what I understand). Here is the result. Race, who has seen his share of becquerel daguerreotypes, said that the tonality is excellent and was thoroughly amused by the fact that the actual camera used for exposure was also used to develop the plate.